David Reid impressed us greatly last year with his Vault-back guitar, so much so it scooped our 2003 award for Best Acoustic Over £1000. Though it was a complex instrument to construct, it displayed a level of workmanship and attention to fine detail that were never the less than superb. It played well and sounded good, too. This time around, the spotlight is on a conventional Reid – an auditorium that is one of Davids main stock models. It’s done in a choice of timbers; ours is an Indian Rosewood backed one with a Sitka spruce top. Woods, of course, are solid throughout. Size-wise the guitar measures 390mm (roughly 15.4”) across the lower bouts, with a moderate maximum rim depth of 103mm. Reid’s auditorium profile – which he also employs on the Vault Back – is quite distinctive, with a relatively wide span across the upper bouts which are radiused with a tightening curve as they run from the shoulders towards the waist. Aesthetically I’d prefer a slenderer, more evenly rounded treatment here, but it’s one of those cases where the instruments lines look more elegant in the playing position than when standing up. Construction is immaculate and the materials of tip-top quality. The Sitka front, close grained and richly cross-silked, carries a pretty, wood-inlaid soundhole rosette of Paduk and quilted Maple. Another light wood – flamed sycamore – plays a major role in the guitar’s looks, being used for the top and back binding, edging the pearl-dot ebony fingerboard and, in bookmatched form, for facing the Spanish-style headstock. The ebony bridge is treated to boxwood pins with abalone dot. Reid employs a form of ‘double-X’ bracing, and on the auditorium this is modified compared to the earlier instruments. The main change, apart from re-jigging the relative dimensions and shaping of the treble- and bass-side struts, is gluing an additional piece of wood – like a bridge – over one of the scalloped areas on the bass side of the main ‘x’. This unusual device acts like a spring to drive the top harder, says David, helping produce more bass and sustain. Another Reid trade mark is using small squares, or cleats of wood to tie the two halves of the back together, rather than the single strip of wood that most makers use. Like the rest of the internals, which include mahogany back braces and kerfings, they’re fashioned and applied to perfection. Before looking at the neck, the headstock merits attention in it’s own right – it’s a work of art. To help achieve a decent break-angle for the strings over the nut, Reid scarf-joints the peghead, but you’d never know it unless you look really, really closely. The scarfing is disguised not only by the sycamore facing, but also by a rear overlay of Macassar ebony and side veneers of neck-matching mahogany. 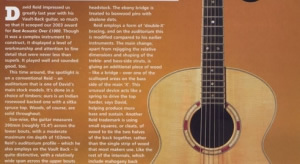 The top and back facings are themselves underlaid with contrasting veneers for a coachlined effect, and the whole headstock is topped of with Reid’s discreet pearl dot marker motif. Fab. The 650mm-scale neck, of high quality Brazilian mahogany, has a fingerstyle nut width of 45mm, but broadens relatively gently so that the width is an easily manageable 54mm across the octave fret. Depth – from 20mm to 23mm – is kept moderate to prevent the grip feeling bulky, and the fairy flat-backed profile also helps in this respect. Sprayed like the rest of the instruments with an acid-catalysed gloss lacquer, it’s a fast played, with plenty of air for picking – but not so broad as to alienate chord merchants. 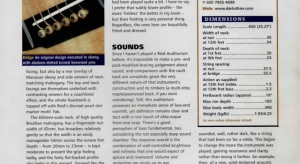 One small difference to the Vault Back I reviewed in Guitar 14/4 is fret height – the auditorium’s medium-width ones feel slightly taller. The explanation is not a change of fretwire, simply that Reid had given the Vault’s frets a light stoning before being sent out because the guitar had been played quite a bit. I have to say I prefer that subtly lower profile – the more ‘fretless’ the better in my book – but then fretting is very personal thing. Regardless, the ones here are beautifully fitted and dressed. Since I haven’t played a Reid Auditorium before, it’s impossible to make a pre- and post-modified-bracing judgment about sound, and comparisons with the Vault Back are unrealistic given the very different nature of the instrument’s construction and its timbers (a multi-strip maple/pearwood back, if you were wondering). Still, this Auditorium possesses an immediate sense of low-end warmth, yet definition remains clear and taut with a nice touch of sitka-esque front-end snap. There’s a good perception of bass fundamental, too, considering the not especially deep sound chamber. The response overall is the combination of well-controlled brightness and richness that one would expect of spruce and rosewood. Volume and projection are nicely up to a par. Paradoxically perhaps, the guitar delivers better now than when it turned up. Though I was assured that the strings were brand spanking new, the bottom E sounded, well, rather dark, like a string that had been on for a while. This began to change the more the instrument was played, gaining resonance and clarity rather than losing it further. An example, then, of a new, solid-timbered acoustic beginning to evolve its personality over a matter of days, if not hours. It often happens, and this guitar is heading very agreeably in the right direction. Though not such a visually spectacular tour-de-force as Reid’s Vault Back – few acoustics are – this guitar has thoroughbred quality written through it like a stick of rock. Also, being of conventional construction, the price is a lot kinder on the wallet. The whole standard of build and detailing really is world class, all the more praiseworthy for the fact that David uses very little machinery with which to bang out zero tolerances every time. The guitar plays a treat, its sound seems to be ripening all the time, and any discerning picker should be chuffed to own one. I predicted last year that the guitar world would be hearing a lot more about David Reid. Well, you just have, and it’s good news again.